In representation theory, abstract algebraic structures are represented using matrices or geometry. These representations provide a bridge between the abstract symbolic mathematics and its explicit applications in nearly every branch of mathematics as well as in related fields such as physics, chemistry, engineering, and statistics. In Combinatorial Representation Theory, combinatorial objects are used to model these representations. These are refined enough to help describe, count (how many there are), enumerate (how to generate them all), and understand the representation theory. Furthermore, the interplay between the algebra and the combinatorics goes both ways: the combinatorics helps answer algebraic questions and the algebra helps answer combinatorial questions. Particularly in the last couple of decades, the field of Combinatorial Representation Theory has become a thriving discipline. Some recent catalysts stimulating the growth of this field have been the "crystals" discovered by Kashiwara and Lusztig and the development of the combinatorics of affine Lie groups and their connection to mathematical physics. In the 21st century Combinatorial Representation Theory lives in the intersection of several fields: combinatorics, representation theory, analysis, algebraic geometry, Lie theory, and mathematical physics. These fields often operate under separate umbrellas, and the primary goal of this program is to bring together the experts of the various flavors of Combinatorial Representation Theory together in one interdisciplinary setting. 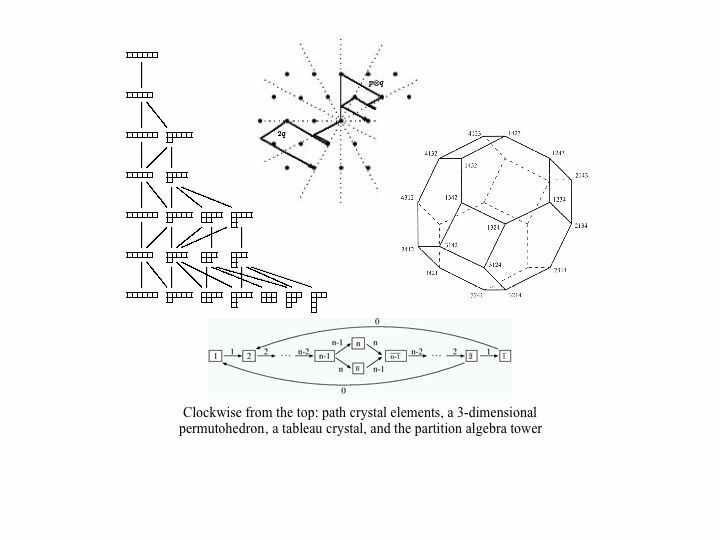 The very recent connections between path models for crystals and the geometry of the loop Grassmanian and between complex reflection groups and p-compact groups are indicators that future holds even more gems for this field. The program will make an effort to focus on main problems of the field such as: positive combinatorial formulas: q-weight multiplicities, Kazhdan-Lusztig polynomials, generalized Littlewood-Richardson coefficients; combinatorial indexings and constructions of irreducible representations: Springer correspondences, Langlands classifications, path models, tableaux; the Virasoro conjecture: counting branched covers of Riemann surfaces, Hurwitz numbers, cycle types, symmetric functions, determinant formulas;representation theoretic interpretations of Macdonald polynomials: Hilbert scheme, diagonal invariants, affine and graded Hecke algebra modules: distributions and convergence of random processes: random matrices, subsequences of permutations, statistical mechanics models;decomposition numbers for representations: affine Lie algebras, modular representations, highest-weight categories, homology representations, finite goups of Lie type;product structure in cohomology and K-theory: Schubert varieties, quiver varieties, toric varieties, loop Grassmanians.cluster algebras: generalized associahedra associated with root systems, coordinate rings of flag varieties and their double Bruhat cells. product structure in cohomology and K-theory: Schubert varieties, quiver varieties, toric varieties, loop Grassmanians. cluster algebras: generalized associahedra associated with root systems, coordinate rings of flag varieties and their double Bruhat cells.